Now it’s June, we’re into the preparing-for-camp season. My Facebook timeline is strewn with appeals for helpers for various ventures around the country, Rocky and Bee are busy confirming exactly who is coming from our youth group and making sure we have the funds, the Vicar has booked the minibus and now my thoughts are turning to the bookstall that I’ll be running again this year. Last year I had lots of fun planning the stall and reviewed a few books in the process. We had 50 or so 11-14 year olds from a range of booky and non-booky backgrounds. That younger secondary school end covers a wide range of abilities and maturity. Some kids were from Christian homes, some didn’t come to church at all. So the bookstall aimed to cover a pretty wide base. We got our bookstall from the always-obliging 10 of Those, who have just launched a special camp bookstall service which I’ll be using this year. If they don’t have the book you want on their website, they will get it for you. Bibles – we had great value NIVs costing about £5 which went like hot cakes, but these will be more expensive this year because there’s a new translation out. So I’m not sure how many we’ll sell. This year we’ll be studying Mark’s gospel at camp so I’m going to stock them – and they will be affordable, even if whole bibles are too pricey. Bible reading notes – I stocked XTB (for 7-11s0, Discover (11s-14s) and Engage (14s-18s). They didn’t sell all that well. Bible guide – We sold a good few copies of the YP’s Guide to the Bible – it only cost £2.50 and was affordable and interesting to look at. Boring Bible series and 50 Weirdest/Goriest/Wildest Bible Stories (and similar by Andy Robb) – these cost £4.50 and are undated bible devotions. They were very popular and I’ll be stocking up this year. For Girls Only & No Girls Allowed – These gendered devotional books sold well – I stocked a couple of each, but could have sold more. These are a little more expensive – around £8. Grill a Christian – We sold this book at £2 – it’s packed with apologetics. Very popular with older Pathfinders (and with folk at church where I sold off some spare copies after camp). The Case for Christ (Youth Edition), Case for Faith for Kids, Case for Christ for Kids – these sold well too. 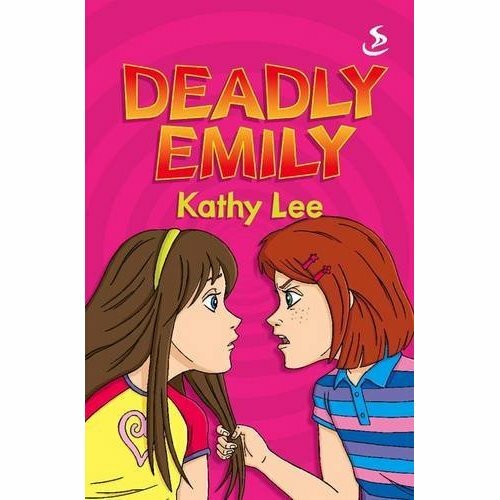 Deadly Emily by Kathy Lee – I was very en couraged to sell this book to a couple of girls who aren’t great readers. I will be stocking more fiction for those who find non-fiction (even biographies) a bit heavy going. I am increasingly convinced that teenagers and preteens who love to read stories (like the Queen) should be reading stories with a Christian worldview. You can tell the truth in fiction. Trailblazer biographies – we sold a bunch of these shortish books at £3. They are biographies and we stocked a variety, including ones of John Newton, Joni Eareckson Tada, Mary Slessor, Amy Carmichael etc. There are lots of these, including a new Eric Liddell one, which will be on our stall for our Olympic theme this year. Lightkeepers (Ten Girls/Ten Boys series) – these are also short biography books. They also sold well at £3. Sneaking Suspicion, If I were God I’d… (by John Dickson) – We sold these to some of the older teenage boys. School Survival – An excellent book on school life. Peril and Peace – we sold this book of church history to an older Pathfinder who was looking for something stretching. This is one of a series of 5 Chronicles of the Ancient Church. We sold a few booklets like: Why did Jesus Die? Why did Jesus Come? Why did Jesus Rise? How do I know I’m a Christian? How do I show I’m a Christian? These were only 20p so a few kids picked them up. I also bunged a few books on the stall for leaders – including the excellent Enough by Helen Roseveare. Later I’ll post a list of some new books I’m planning to stock this year. Both 10ofthose and The Good Book Company have published books for younger teens this year. Every year the Vicar helps out on a CPAS Pathfinder venture (known as ‘camp’ even though we don’t use tents) in Devon, and I join him there with the kids. A great time is had by all learning about Jesus and having a fabulous holiday. This year I have volunteered to help out with the bookstall. They have one every year and I noticed last year that the selection of books was tailored more to the upper age of the camp and to the more literate kids. A diverse range of children come along to our camp, from 14 year old clergy kids from the suburban Home Counties to 11 year old barely literate unchurched youngsters from the inner city. And I think it’s a real challenge to find books that will suit them. I’m currently hunting for recommendations and have bought a small pile of books to review from our local CLC bookshop. I’ve had a couple of recommendations which I’ve not managed to pick up: Hannah MacFarlane’s books and that old classic, The Chocolate Teapot by David Lawrence. I would love to have an appropriate book for every Pathfinder this year. So I am asking around for recommendations. Have you found any good Christian literature recently? I’m not just looking for books either – how about journals, booklets or dvds? If you’ve done youthwork, or have kids between the ages of 11-14, give or take a couple of years, or have any ideas at all, I’d love to get your recommendations. Have you run a bookstall on a summer camp? What sells well to younger teens? I’m especially interested in books that will appeal to boys, who I know are often not keen readers. All help gratefully received!